Had I blind-folded myself this past week, I wonder if I would have known the difference between driving the 2016 Lexus 300h and the 2016 Avalon XLE. I suspect I would; these are two very different vehicles (hybrid and Touring edition), however, look much the same. Perhaps a more fair comparison would be the Lexus 350 and the Avalon XLE Touring, or of course, hybrid to hybrid. Our test Lexus and Avalon both came in the Autumn Shimmer color. The Lexus purist might argue with the above statement. And there are, to be sure, some pronounced differences: for instance, just a small thing: When unlocking the Avalon, itâ€™s noisy-a clunky kind of noise when pressing the fob-almost as if the trunk is opening. With the Lexus, the sound is hardly noticed. The most noticeable change in the 2016 Avalon is its wider grille, which replaces the current â€˜smilingâ€™ grin for more of a frown. The current modelâ€™s fog lamps are replaced by vertical turn signals, and the headlamps have been slightly redesigned, with dual-wing LED running lamps added to the Touring models. In the rear, all Avalon models receive new taillamps and chrome garnishes on the bumper. The appearance of the 2016 Avalon is one of a long vehicle, with ample rear seating room. The Avalon model line-up goes from four to five trim levels for 2016, including the XLE, XLE Plus (new for 2016), XLE Premium, Touring, and Limited. Hybrid models will be offered in XLE Plus, XLE Premium, and Limited forms. Updates are new since the last big change in 2013. 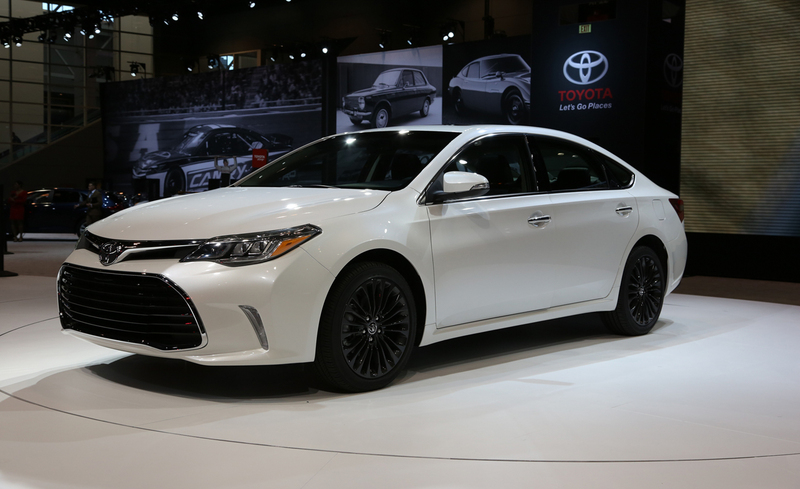 All Avalon trim levels offer the standard Toyota Entune audio system with seven-inch touch screen. The XLE Premium models add more technology such as navigation and wireless device charging. The Touring model sports a unique front fascia, LED headlamps, and redesigned dark-gray 18-inch wheels. Limited models also get 18-inch wheels, finished in â€œSuper Chromeâ€. Optional safety items such as adaptive cruise control, forward-collision warning, and lane-departure warning are also available. This writer loved the dark-gray wheels. There isnâ€™t any feature missing on the 2016 Avalon, and believe me, one gets used to having everything at her fingertips. Paddles are also a part of the Touring model to provide the manual driving experience. There are two powertrains available on the 2016 Avalon: Hybrid (200 hp., 4 cylinder) and the 3.5-liter, V6. The Avalonâ€™s suspension has been re-tuned for 2016, with a very composed ride. The Touring model has a little stiffer ride, but for our tastes, a firmer ride makes for a better controlled vehicle. This change may not appeal to those attracted to previous Avalon models. The interior is of high quality, and a rich two-toned dash is standard. Heated rear seats are standard, as is three-zone automatic climate control. A rear sunshade is also standard equipment. The JBL audio system with 785 watts is first class, and we always favor the XM radio choices. With all the goodies available on the 2016 Avalon it pushes this sedan into a higher price range. So competing with a vehicle like the Chevrolet Impala doesnâ€™t make sense (although maybe the hybrid version is closer). And, although not positioned as a â€˜luxuryâ€™ sedan, it is competing with others in this category (Infiniti Q50, etc.). Engine: 3.5-liter, V-6, 268 hp. Fuel tank capacity: 17 gal. EPA fuel economy: 24/21/31 mpg. Warranty: 3 yr./36,000-mile Basic; 5 yr./unlimited mileage Drivetrain; 2 yr./25,000-mile maintenance, 2 yr./25,000-mile Roadside Assistance. Erica Enders-Stevens celebrated her second straight Pro Stockcar championship title at the Toyota Nationals in Las Vegas, entering the race with a fairly large lead over her closest challenger, 4-time champion Greg Anderson, in the standings. She previously beat Anderson in the finals at Route 66 Parkway in Joliet, IL on July 2, 2012. The win made her the first female driver to win in NHRA Pro Stock. Her winning time at that event was 6.627 seconds for the 1,320 foot run. To date, she currently holds both sides of the NHRA National Record for Pro Stock, 6.464 seconds and 215.55 mph (346.89 km/h), set at Englishtown, NJ in 2014. Enders-Stevens, 32, has been racing since she was 8 years-old, and ended up winning the Division 4 Jr. Dragster championship in 1993 (the 8 to 9 year old class), before being crowned Junior Dragster Driver of the Year 2-years later. In fact, she had 37 career wins during her 8 years competing in the division, and her original Enders Racing Junior Dragster car is on display at the Wally Parks NHRA Motorsports Museum. 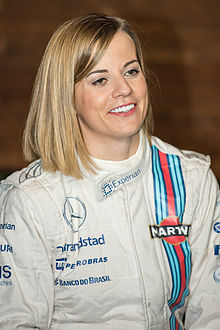 At the age of sixteen, she moved up to compere in her first national event final (Houston) to become the youngest NHRA national event finalist, and was named the 2000 NHRA Sportsman Rookie of the Year. Then In 2004, Erica became the 35th woman in NHRA history to earn a national event victory, in Super Gas class at Houston. The following year Enders-Stevens became the first woman to compete in the NHRA’s Pro Stock Category since 1993; the first woman in NHRA history to qualify in the top-half of a Pro Stock field, as well as the first woman to reach a final round in Pro Stock (at Chicago). Enders finished up with more round wins in 2005 than all other female drivers in NHRA Pro Stock history combined. She was also a finalist for the â€œRoad to the Futureâ€ award for the seasonâ€™s top rookie. But that was only the beginning of an incredibly successful career and a long line of other firsts that have included being the first woman to qualify No. 1 in Pro Stock at Heartland Park, Topeka, KS in 2006, followed by another runner-up finish at the Gatornationals in Gainesville, Fl. After returning to Cagnazzi Racing in 2011, Erica then broke the national speed record in Pro Stock, with a top speed of 213.57 mph at the Gainesville round, and defeated 2004 NASCAR Sprint Cup Series champion Kurt Busch in Round One of that meet. This year, Erica Enders-Stevens smashed two records for female NHRA drivers. At Charlotte’s zMax Dragway in September, she scored her 19th career win, surpassing a record previously held by Shirley Muldowney in Top Fuel for the most NHRA national event wins by a female driver. She then broke Pro Stock Motorcycle rider Angelle Sampeyâ€™s single-season record of seven wins in 2001, this October when claiming her 8th victory of the year, at the Texas Motorplex. Meanwhile, Sundayâ€™s events in Vegas also saw Anton Brown take the title for the Top Fuel championship, with Anton Brown taking the title, while Robert Hight the Funny Car final over Tommy Johnson Jr. in the Funny Car final. However, the title for that class is yet to be decided. The series ran its last elimination round of the season on Nov. 15 at Auto Club Raceway in Pomona, CA. Driving the restyled 2016 Hyundai Tucson is a very different experience. Previous iterations of this small ute hail back to much less sophisticated utes, with hard rides and a minimal feel. Newly styled, using Hyundaiâ€™s â€œFluidic Sculpture Styling,â€ the 2016 Tucson is more modern and a lot more sensual, if thatâ€™s the word. Curvier and attractive, this Tucson fits right into the styling cues of other competitors; namely, the Jeep Cherokee, Honda CR-V, Mazda MX5, Nissan Rogue, RAV4 and Ford Escape. Competitively priced, as one would expect from Hyundai, the new 2016 Tucson is the third generation, with several trim levels available: SE ($23,595), ECO ($25,045), Sport ($27,045), Limited ($30, 795) and Limited Ultimate ($33,545). With something for every taste, the Tucson is available in front-wheel-drive and optional all-wheel-drive. The Sport version is new for 2016. All-wheel-drive is available on the Ultimate Limited edition, at a cost of $1,400. Consumers may also opt for the SE Popular version which adds more standard features and accessories, as well as AWD. A strong value story-and leader-the 2016 Tucson comes equipped with plenty of standard features, and a few options. Our test model, the Limited AWD version, came equipped with just two available options: carpeted floor mats ($125) and Cargo cover $190). The redesigned Tucson offers available engines, our was the 1.6-liter Turbocharged version, and the standard engine is the 2.0-liter 4-cylinder (164 horsepower, 151 lb ft. torque). The turbocharged version, also a 4-cylinder puts out 175 horse and 195 lb. ft. torque. While we do like the quietness and available power of the turbo engine, the lag is not a welcome result. One new feature enjoyed by most grocery shoppers is the auto-opening rear hatch. Simply stand in back with the Fob in hand (or pocket!) and after about 3 seconds, the gate will rise up. Walahâ€¦..pretty coolâ€¦and a bit of magic. Small utility vehicles are really front-wheel-drive passenger cars, but with larger dimensions. So driving one feels somewhat like wheeling a sedan. There are, it would seem, many reasons for their popularity, much having to do with drivers being higher up off the ground. The 2016 Tucsonâ€™s suspension system has been overhauled and itâ€™s noticeable; a much friendlier, less jarring ride. The 2016 Tucson gets increased cargo space, increased structural rigidity, upgraded interior materials and space, and extensive use of high-strength steel in the body shell. This is all noticeable as the redesigned Tucson is a much quieter, calmer riding vehicle. Wind-noise is minimal, if at all, and the 7-speed automatic transmission is seamless. Hyundai has just about got this vehicle down to a science. It keeps getting better and better. Fuel Tank Capacity: 16.4 gal. 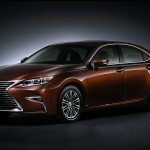 The restyling of the 2015 Toyota Camry Hybrid happened first For 2015, and now it is the stablemate Lexus ES 300hâ€™s turn. The luxury sibling was restyled for the 2016 model year, with similar treatment. The Lexus 300h was first shown at the 2015 Shanghai Motor Show. It looks considerably different from its predecessor, but mechanics remain the same. New on the ES 300h exterior is the front fascia, now with an enlarged, one-piece version of the infamous Lexus â€˜spindleâ€™ grille. One canâ€™t mistake a Toyota for a Lexus with this now-familiar front end. Also new on the outside are the upgraded LED headlights and taillights with L-shaped elements. A new design for the 17-inch alloy wheels is also visible. Four new colors are in the lineup for 2016: Nightfall Mica, Cavier, Eminent Pearl White and our test car, Autumn Shimmer which resembles a black cheery color. Lexus hasnâ€™t changed its hybrid powertrain which is still the 2.5-liter Atkinson-cycle four-cylinder and Toyota Hybrid Synergy Drive system. The system utilizes a pair of electric motors that substitute for a transmission. This is unchanged since new on the 2013 model. Fuel economy is a combined 40 mpg (41/39 mpg), similar to competitor Lincoln MKZ Hybrid. The Ford Fusion also joins the Lexus ES 300h and MKZ Hybrid as mid-sized sedans with the Hybrid option. One can separate the Lexus ES 300h from the regular ES model by the trunk spoiler, hidden exhaust pipe and badging. The jury is still out for this writer on the ESâ€™s new look; it resembles more the Avalon look than Camry, we think, and gives the illusion, somewhat of a much bigger sedan. 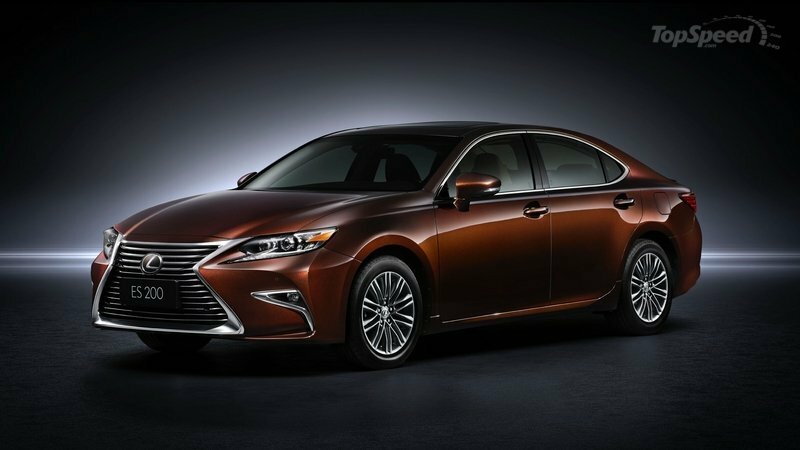 New technology on the 2016 ES 300h includes the new Lexus Safety System (a bundling of several electronic driver aides including the pre-collision system, lane departure alert, intelligent high-beam control and adaptive cruise control. The Lexus Enform Service Connect is also new for 2016 and allows drivers to apply an app (iOS) or a website to set push notifications for vehicle maintenance. On the inside, updates include a new steering wheel and shift knob, additional trim color options, and improvements in fabrics and surfaces. The Lexus hybrid powertrain is very efficient, and the 300h ride comfortable and composed. Like with all Lexus products, one is motored around in luxury and silence. As with other new vehicle manufacturers, electronics can be complicated and annoying to use. In the last press car we drove, we found it too easy to become distracted while trying to get from one radio station to another. While we have become somewhat accustomed to the Lexus control knob, it can be laborious. We tried in vain to work the Nav system but was unable to do so, wondering if in fact, if there was one. There has to be. We will give it another try, but if it’s this hard…. Of course, there are numerous hybrid sedans to choose from today; not like in the past. 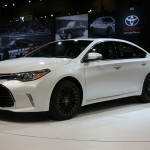 One may be able to deck out the Toyota Avalon Hybrid, save a little money and have a tad better fuel economy. Or the aforementioned Lincoln MKZ. For Lexus fans, though, there isnâ€™t anything like it. Itâ€™s easy to understand how after owning one Lexus model, you automatically opt for another. No worries, no fears about a non-performer in every sense, The Lexus brand promises-and delivers. The 2016 ES 300h is a very roomy sedan, easily accommodating 5 riders. Itâ€™s premium all the way. And once you get used to all the updates in technology; namely, the pedestrian-detection feature-youâ€™re hooked. Design the car as you wish, with a mix/match of features. Combine them as you like. The Lexus 300hâ€™s Nav package now features a bigger 8-inch display screen, the mouselike Remote Touch electronics interface, voice controls, traffic reporting, enhanced Bluetooth connectivity and the Enform suite of smartphone-connected apps and concierge services. The 2016 Lexus ES 300h isnâ€™t as quick as itâ€™s stablemate the ES 350, but then one wouldnâ€™t expect that from a Hybrid. Acceleration, though, is acceptable and more than adequate for most driving. Itâ€™s quiet and pleasant, and never interferes with driving pleasure. Engine: 2.5-liter, 16-valve, 4-cylinder, 200 hp.